The tripod is made of quality magnesium alloy, light and stable, can be reversed 180 degrees, easy for outdoor carrying. Quick release plate allows you to connect and disassemble the camera in seconds. 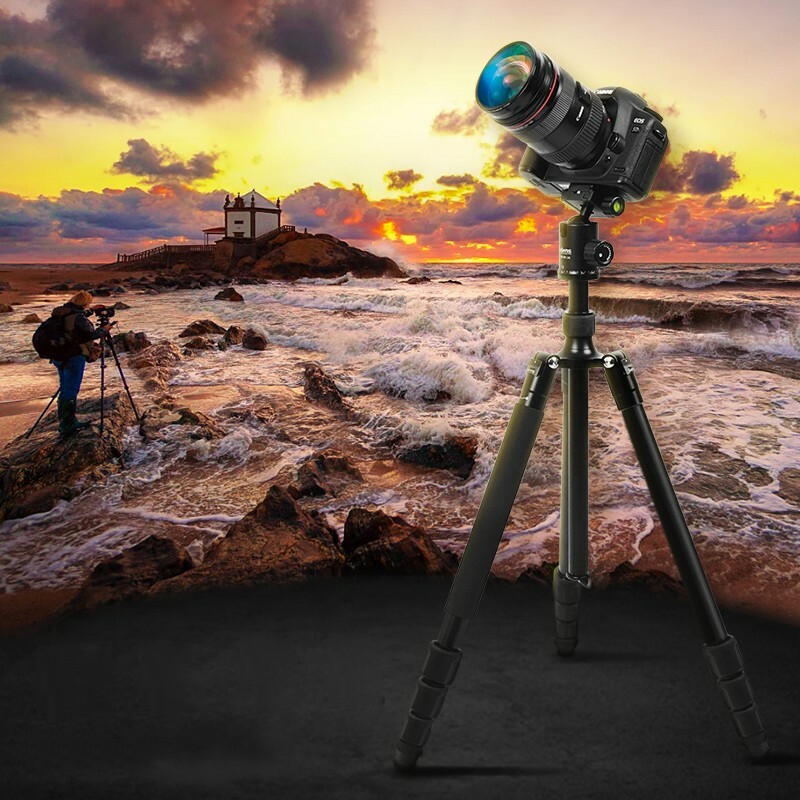 With two independent control knobs, come with a professional 360 degree tripod ball-head, it helps to improve camera activity range when panoramic shooting. Sponge grip, anti-skid and sweat,defensive cold and keep warm, give you intimate protection. -With two independent control knobs, come with a professional 360 degrees tripod ball-head, it helps to improve camera activity range when panoramic shooting. -Quick release plate, come with 1/4’’ screw, suitable for most of DSLR camera, allows you to connect and disassemble the camera in seconds. -The tube can be reversed 180 degrees, lowest angle shooting, macro shooting, and special photography can be achieved through inverted central axis. -Stability hook,can hang other heavy objects to increase the stability of the tripod. -With rubber footpads and stainless pins, the tripod suitable for rugged terrain to be used in harsh environments and more stable. -4-section legs with a twist knob lock for height adjustment, can adjust from 18 inch to 61 inch for your different shooting requirements. 2-in-1 Tripod, one of leg with sponge on it can be unscrewed and work alone as a monopod. 1 x Selens TA-462 Tripod. 1 x 360 Degree Ball Head. 1 x Selens Protect Bag. The tripod is made of quality magnesium alloy.